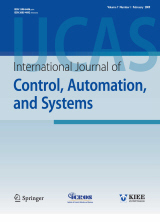 Abstract : This paper presents two nonlinear PID (NPID) controllers which control the glycol temperature of a regasification system for LNG-fuelled engines. The NPID controllers have a parallel structure of the three nonlinear P, I, D actions or the linear P, D actions and nonlinear I action. A nonlinear function is employed to scale the error as input of the integral and implemented as a Takagi-Sugeno (T-S) fuzzy model. The controller parameters are optimally tuned by using a genetic algorithm. Furthermore, the stability problem of the overall system is verified based on the circle criterion. A set of simulation works is carried out to validate the efficiency of the two proposed controllers. Keyword : Circle criterion, nonlinear PID controller, temperature control, T-S fuzzy model.